A Daily Handful of Nuts Keeps the Doctor Away? Author SimaPublished on December 5, 2016 March 7, 2018 Leave a comment on A Daily Handful of Nuts Keeps the Doctor Away? A large analysis of current research shows that people who eat at least 20g of nuts a day have a lower risk of heart disease, cancer and other diseases. The analysis of all current studies on nut consumption and disease risk has revealed that 20g a day -- equivalent to a handful -- can cut people's risk of coronary heart disease by nearly 30 percent, their risk of cancer by 15 percent, and their risk of premature death by 22 percent. An average of at least 20g of nut consumption was also associated with a reduced risk of dying from respiratory disease by about a half, and diabetes by nearly 40 percent, although the researchers note that there is less data about these diseases in relation to nut consumption. The study, led by researchers from Imperial College London and the Norwegian University of Science and Technology, is published in the journal BMC Medicine. The research team analysed 29 published studies from around the world that involved up to 819,000 participants, including more than 12,000 cases of coronary heart disease, 9,000 cases of stroke, 18,000 cases of cardiovascular disease and cancer, and more than 85,000 deaths. While there was some variation between the populations that were studied....the researchers found that nut consumption was associated with a reduction in disease risk across most of them. The study included all kinds of tree nuts, such as hazel nuts and walnuts, and also peanuts -- which are actually legumes. The results were in general similar whether total nut intake, tree nuts or peanuts were analysed. What makes nuts so potentially beneficial, said Aune, is their nutritional value: "Nuts and peanuts are high in fibre, magnesium, and polyunsaturated fats -- nutrients that are beneficial for cutting cardiovascular disease risk and which can reduce cholesterol levels. 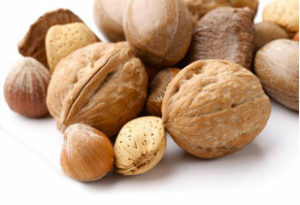 "Some nuts, particularly walnuts and pecan nuts are also high in antioxidants, which can fight oxidative stress and possibly reduce cancer risk. Even though nuts are quite high in fat, they are also high in fibre and protein, and there is some evidence that suggests nuts might actually reduce your risk of obesity over time."